There never seem to be enough words of appreciation or gratitude to give to those who risked their lives and limbs on behalf of all the rest of us. Our military are brave beyond measure and I know that the words “Thank You” are just not enough. So, let’s give back to these amazing people in ways that show via actions our sincerest gratitude. PARADE magazine listed eleven ways to HELP our Soldiers and Veterans. Read the eleven ways YOU can help! 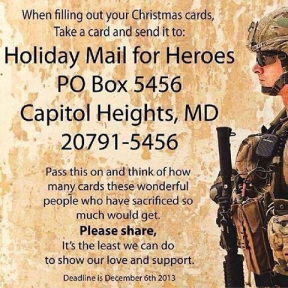 Send a soldier a package this holiday season. And, if nothing else… consider writing an extra holiday card. The information is in the poster below.